Someone in reference to the California Dreaming restaurant in South Carolina said that there were only plantations in SC, not castles. I have to say that we have something pretty close (a lot more so that a restaurant. 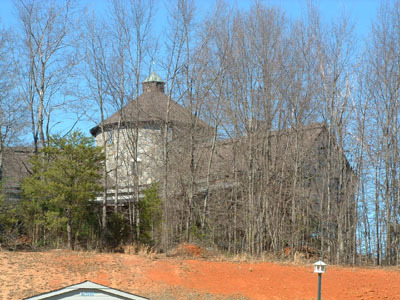 On highway 290 going towards North Greenville there is a castle that was built back in the 1980's (assumption). My family made a weekly trip to that part of town. At one point, it made the local news, extravagantly decorated for the holiday. Soon thereafter, it became vacant, and it stayed that way for years. I was told that the man that built it as his private residence had gotten the money from illegal acts and had been placed in jail for many years to come. I drove my fiance by there last year, and it seems to be occupied again. The story always was of interest to me, just because it was such an unusual home.
! I had some free time today when I was in Greenville, so I decided to try to find the Unknown Castle in North Greenville. Unless there's more than one, I did find it. I observed from a small turn-around with planter near the road and noticed it has a fine, straight two-lane driveway with young trees down the center and a tiny unoccupied guard house at the far end of the drive near some really nice black gates in a brick wall. The castle-house is centered behind the gates for an attractive presentation. It has a wide central turret with Tudor wings. I left, then turned around and returned, deciding I'd leave them a note about your site. The housekeeper (I'm guessing; not the owner) answered the door while I was writing a note. She kindly waited in the doorway while I finished, giving your URL and how to locate "Unknown Castle" in SC. I added that if they're interested, they can email you with info and picture. At one point the housekeeper turned her head towards the inside as she mentioned a new wing, and her voice echoed in the foyer. Ah, it's the little things that make a castle a home! I wrote to you a while back, and told you that I would try to get you a picture of that castle located in the North Greenville area of South Carolina. It's actually located closer to the Sandy Flat community, than the North Greenville community. Attached is a picture I took, with my digital camera. It is not the best of shots. I used to live very close to the "castle" when I was growing up. It was built around 1982-83, and was decorated and put on show in 1984 for Christmas. The owner was a Thompson man. His family was prominent and well known. There were several brothers and family members that were into various public and private businesses. One of the brothers was a preacher/evangelist on a local TV station that he owned and operated. The brother that owned the castle was in the import/export business. The family was also closely tied to a church (Faith Temple), and a printing company (Faith Printing). It is indeed in the Sandy Flat community off Hwy. 290 near Greer and Taylors. There is a lot of growth in that area now with new houses and busninesses, but at the time the castle was built, it was the only thing on that side of the road for about a mile on either side. I went to visit the holiday celebration in 1984, and I remember having to have a ticket to get in. They were very gracious (while bragging about the house) and wanted everyone to see their new home. I went to school with the daughter, and went back to the castle for a very elaborate 16th birthday party for her. The house was very ornate then, and I remember the large spiral staircase leading up the top to the "tower." It reminded me a lot of the foyer in the Beverly Hillbillies, but it was dark and rich wood instead of white marble like on TV. I'm not sure this qualifies as what I think of as a castle, but I'll leave it on the webpage for a while. I grew up near the castle in the Sandy Flats area. The central tower was once a grain silo before it was renovated and the castle built around it. Was wanting to let you know the castle in the Sandy Flat community of South Carolina burned down last night. Not much has came out about the cause or any other details but it was a total loss. Heard it collapse multiple times as the different sections fell in. Thanks to Charles Mosteller for taking and sending the photo.